Lobectomy; drawing shows lobes of both lungs, trachea, bronchi, bronchioles, and lymph nodes. Cancer is shown in one lobe. 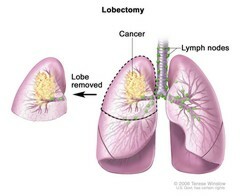 The removed lobe is shown next to the lung from which it was removed.